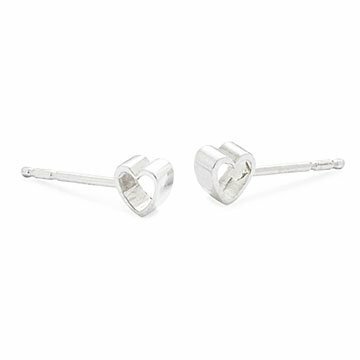 These earrings have an elegant, geometric form that disguises their romantic nature. These earrings from designer Beth Macri are quietly romantic. The handcrafted, sterling silver pieces appear to be simple and elegant geometric forms. But lift the ends for a different perspective, and you can see that they are actually hearts stretched out into three dimensions—filled with love from top to bottom. It's a stylish way to celebrate your love without wearing your heart on your sleeve. Handmade in New York City. These are just the perfect little minimalist earrings, with an unique twist. Ultra feminine and high quality, the way the hearts sit on the ears gives them an unusual look. Love how dainty and different they are than regular heart earrings. Beautiful box presentation, also.